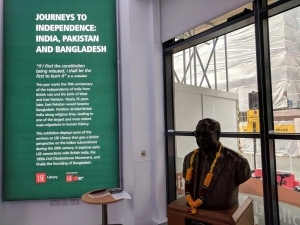 Dr B R Ambedkar, LSE alumnus and author of the Indian Constitution, is depicted in two portraits around LSE’s campus. LSE Archivist Sue Donnelly writes about their arrival at LSE. Bhimrao Ramji Ambedkar obtained his D Phil from the School in 1923 with his thesis The Problem of the Rupee, supervised by Edwin Cannan, Professor of Political Economy. In 1947 he was appointed as Chair of the Drafting Committee for the new Indian Constitution and played a vital role in guiding and editing the Indian constitution promulgated in January 1950. In 1973 LSE received a portrait of Ambedkar from the Dr Ambedkar Memorial Committee of Great Britain. In the half-length portrait Ambedkar is depicted wearing a white suit and holding a copy of the Indian constitution in a book lined interior. The painting is signed G S Nagdeve, 23 October 1970. The portrait was presented to the School on 25 September 1973 by the Dr Ambedkar Memorial Committee of Great Britain. The event in the Old Theatre was attended by Mr M Rasgotra who was the Acting High Commissioner for India, and the Venerable Dr H Saddatissa, Head of London Buddhist Vihara. The portrait was accepted by the School’s Director, Sir Walter Adams who said that “by his work as a scholar and as a man of action, he [Ambedkar] helped decisively to shape the development of India in this century”. 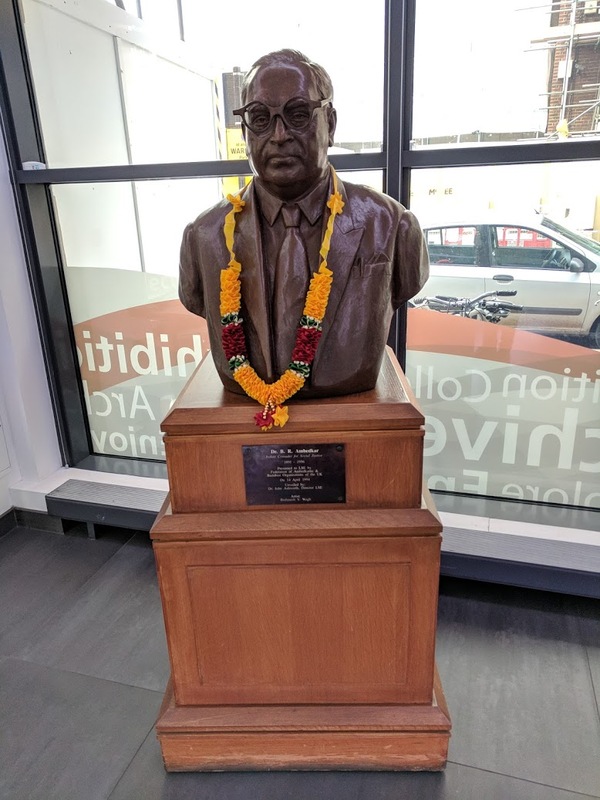 In 1994 the portrait was joined by a bust of Ambedkar sculpted by the Indian sculptor Brahmesh V Wagh and cast in bronze. The Wagh firm of sculptors in Mumbai are renowned for their sculptors of significant figures in 20th century Indian politics. The bust, unveiled on 14 April 1994 by LSE Director, John Ashworth, was a gift to the School from the Federation of Ambedkar and Buddhist Organisations of the UK. The portraits are currently on display in two exhibitions marking the 70th anniversary of Indian independence and the creation of Pakistan. The portrait of Ambedkar can be seen as part of Law and Nationhood: India at 70 in the Atrium Gallery in the Old Building. 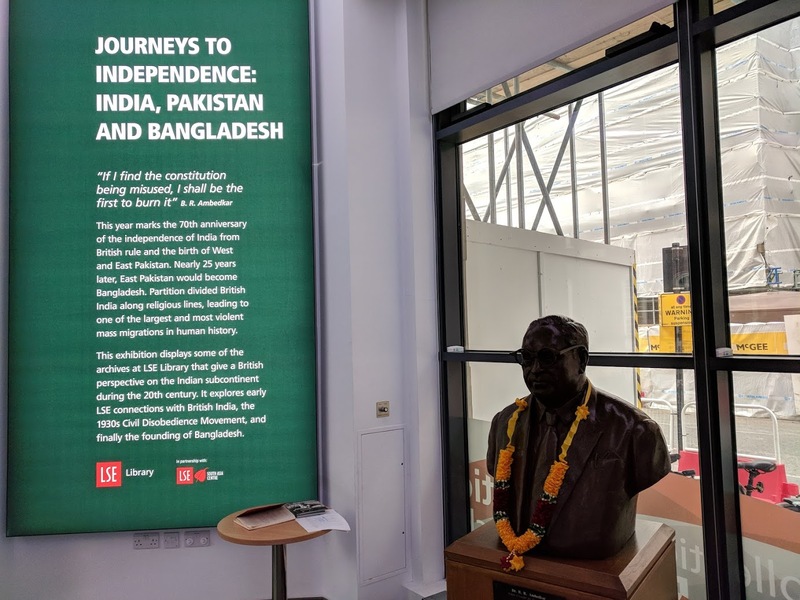 The bust can be seen in Journeys to Independence: India, Pakistan and Bangladesh currently showing in the LSE Library Gallery.